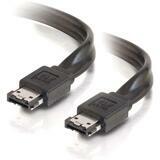 ThinkStation Front eSATA Cable is fully compatible with ThinkStation Systems (P500, P700, P900). This cable is for the front eSATA interface on the front panel. This cable should be installed in ThinkStation 5.25" Flex Module (4XF0G94538).